Entering into the world of human resources can be a daunting undertaking. You are a key stakeholder for recruiting, training, retaining, and developing your employee workforce. 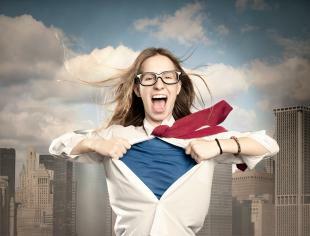 Your responsibilities can become overwhelming unless you break through your challenges to reveal your inner superhero. Human resource superheroes tend to be the first in line for a salary increase and promotions, and are generally well regarded amongst everyone in the company. Even though your colleagues might describe you as efficient, proactive, and productive, these qualities are sometimes not enough to qualify you as the superhero that’s recognized by internal and external industry leaders. Unless you’re an evil villain, most people value others who are honest. People like to be aware of current news and policies within their organization. Ask yourself, “how do I communicate with company stakeholders?” How can you improve your communication so there are fewer questions and seamless transitions during changes within the company? If you’re struggling to communicate an important message or choose to withhold information from people in your company who will benefit, you’re probably going to lose trust amongst your peers. When in doubt, always keep an open line of communication. There’s a memorable cartoon that floats around the internet every so often and its always worth referring back to. The cartoon is called “Corporate Dilemma: Investing in Employees.” One HR rep says, “What if we train them and they leave?” Then the other HR rep replies, “What if we don’t…and they stay?” If you’re not training your employees from day one, you’re making a huge mistake. Avoid this pitfall and make sure you align your employee development needs with high quality training. Not only will leadership appreciate you, but your employees will feel more valued and competent in their work environment. When you just do what’s expected of you, you’re bound to get a pat on the back every now and then. Wouldn’t you rather be the superhero that everyone admires and appreciates on a daily basis? By exceeding expectations, you increase your value and people start to identify you as a leader worth following. Always be prepared to answer questions from your employees and prepare exceptional presentations for your executive team. Identify one way you can exceed expectations starting today and make that your highest priority over the next few months. Mistakes are bound to happen in any work environment no matter how fluid your corporate infrastructure is. Sometimes you can have the best policies and procedures in place, but challenges and setbacks are the true test of your demeanor and professionalism. Strive to be a role model worth looking up to and uphold high standards for your behavior inside the work environment. When your colleagues identify someone worth looking up to, they usually imitate and mirror their behavior. Let that person be you! When you treat each individual with respect, you’re more likely to be reciprocated with respect. Not only will this make your job more enjoyable, but employees will see you as someone they can trust when issues arise in the workplace. Corporate politics and conflict are less likely to erupt when everyone is on the same playing field. Be especially cautious of this golden rule when there are defined hierarchical structures in your business. Don’t play favorites with specific people or teams, and do your best to treat others the way you wish to be treated. Think of your human resource unit like a skeletal structure. Skeletal structures keep organs in place so a body can maintain homeostasis. Your department upholds all of the policies and standards so your company can thrive and produce excellent value for everyone involved. Don’t underestimate the importance of your role because without superhero human resource personnel like yourself, companies would cease to flourish with top-notch talent, fearless workforces, and soaring enterprises.